Galvannealed (or galvanneal) Steel is a carbon steel sheet coated with zinc on both sides by the continuous hot-dip process. Immediately as the strip exits the coating bath, the molten zinc coating is subjected to an in-line heat treatment that converts the entire coating to a zinc-iron alloy. (The iron diffuses from the steel into the coating.) The galvannealed surface has a non-spangled matte finish, a finish very different than the highly metallic appearance of the galvanized coating. At times, the galvannealed coating may appear similar to uncoated cold rolled steel. One of the primary attributes of the galvannealed coating is that the surface accepts paint very readily. It can be painted without the application of a pretreatment, although a pretreatment will enhance the performance after painting. The zinc-iron alloy coating on galvannealed product behaves very differently than the soft galvanized coating. During fabrication, there is almost always some degree of powdering of the coating. Heavier coatings will exhibit more powdering. For this reason, typical galvannealed coatings are thinner than most galvanized coatings. Since galvannealed product is intended to be painted, a thinner coating can be successfully applied to provide long product life. As stated previously, galvannealed sheet is specifically designed to be used in the painted condition and can be readily postpainted, i.e., painted after fabrication of a part. It is not intended to be prepainted, i.e., painted in coil form and then formed into a shape. The brittle nature of the coating makes forming after painting a difficult task to avoid degradation of the corrosion performance in subsequent service. The excellent corrosion resistance that results when the alloyed coating is painted is useful in many applications that demand long service life. For example, painted galvannealed sheet provides excellent service when used on automobiles for both exposed and unexposed applications. It is also specified for buses, trucks and other vehicles where long life is important, garage doors, highway signs, computer chassis, and vending machines - as well as any other applications that require good resistance to undercutting corrosion of the coating. 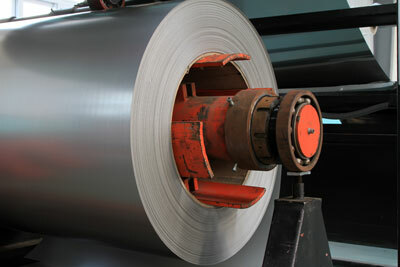 Galvannealed sheet offers a combination of good paintability, easy weldability and galvanic protection. Our years of excellent customer service and professionalism have been the foundation of Curtis Steel Company since 1976. Providing high-quality galvannealed steel sheets is a specialty of ours that we take pride in. Give us a call at 1-800-749-4621 or contact us online and request a quote today!